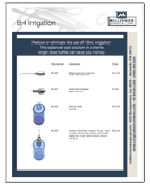 BH Irrigation	Bishop Harmon cannula, bulb and adapter, and anterior chambe irrigator set. 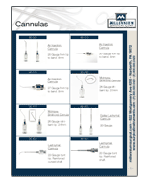 Cannulas	A sampling of our best-selling cannulas including air injection, McIntyre-Binkhorst, Lachrymal, Knolle, Anterior Chamber, Hydro Dissection, Slade, Graether, Bishop Harmon, and more. 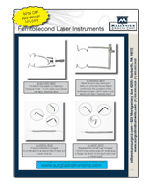 Femtosecond Laser	Speculums, choppers, forceps, flap lifters, double-ended instruments, and more. 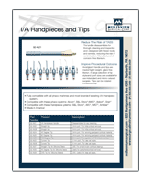 IA Tips and Handpieces	Titanium handle which disassembles for thorough cleaning and inspection, designed with fewer nooks and crannies, and reduces the risk of contamination. 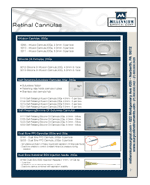 Light-weight, glare-free. 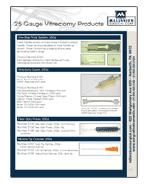 A large selection of tip styles and port sizes are available. 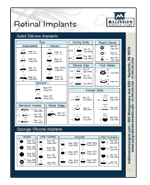 Tips can be rotated intraoperatively. 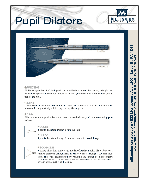 Pupil Dilators	Effective and simple dilation via multiple points through a 2.5 or 3 mm incision. Available in five styles. 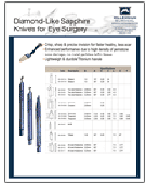 Sapphire Knives	Crisp, sharp and precise incisions for faster healing and less scarring. High density gemstones with no metal particles to leave in tissues. Lightweight, durable Titanium handles. 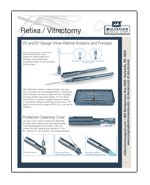 Vitrectomy Products	25 gauge trocar system, cutters, fiber optic probes, and cannulas (brush, soft, and Charles Flute tips).